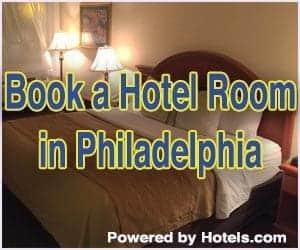 Philadelphia is known as the birthplace of America, and millions of people visit the city every year to see historic and patriotic sites like Independence Hall, the Liberty Bell, and Valley Forge. 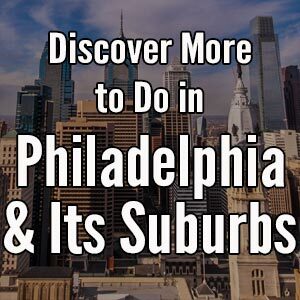 However, moving beyond the major sites of the Independence National Historic District and the Museum of the American Revolution, there are many other places in and around downtown Philadelphia that can teach you about the history of America’s founding and leave you feeling a bit more patriotic in the process. The Germantown White House, also known as the Deshler-Morris House is located on what was Philly’s countryside in the late 18th century. Washington spent time here on two occasions during his presidency. The first was in November 1793. Washington had briefly left Philadelphia to visit Mount Vernon in Virginia. However, when he tried to return, the city had been quarantined because of a Yellow Fever epidemic, forcing Washington to find somewhere else to run the country from. After inspecting a few spaces, he eventually settled on the home of Issac Franks and stayed there from November 16-30. The following year, Washington returned to the home for a family vacation in September and October 1794. While here, he met with members of his cabinet, including Thomas Jefferson and Alexander Hamilton. 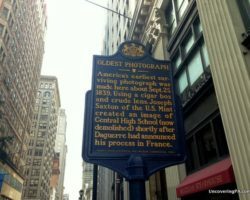 It was from here, that he left to lead his troops to western Pennsylvania to counter the Whiskey Rebellion. More information about visiting the Germantown White House can be found on the National Park Service’s website. Benjamin Franklin is one of eight signers of the Declaration of Independence buried in Philadelphia and the surrounding area. 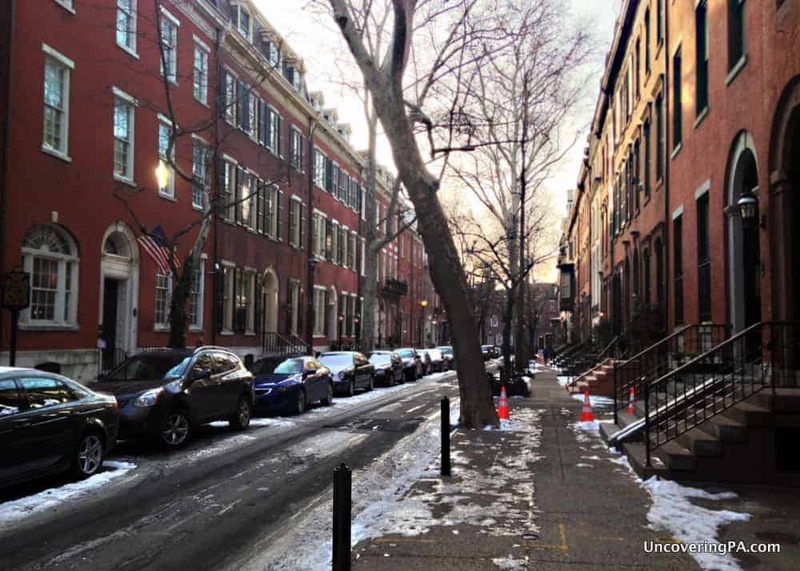 Most visitors know that Benjamin Franklin is buried in Philadelphia’s Old City. However, few realize that there are a total of seven other signers of the Declaration of Independence buried at various cemeteries around the city. Many of these grave sites, including Franklin’s, are located in the two burial plots belonging to Christ Church. 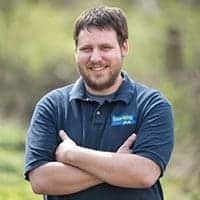 There are also signers of the Declaration of Independence buried in Laurel Hill Cemetery, Christ Episcopal Church Graveyard, both in Philadelphia, and Saint Paul’s Burying Ground in nearby Chester. More information on the burial places for these men, as well as all of the other signers of the Declaration of Independence, can be found here. 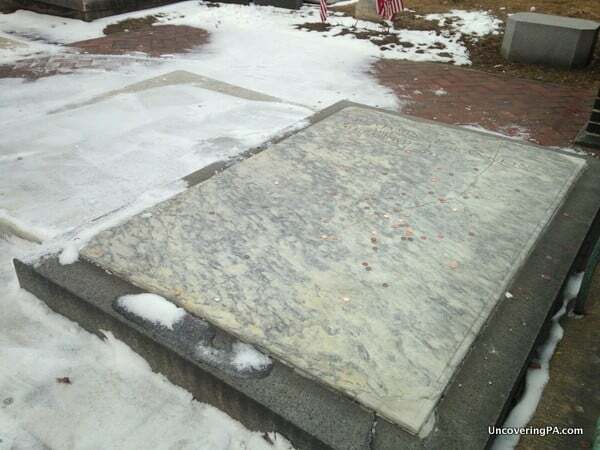 You can also find the current gravesite (and the former gravesite) of a Founding Mother, Betsy Ross, in Philadelphia. She is currently buried at the Betsy Ross House, but her former gravesite can be found at Mount Moriah Cemetery. Cliveden was the focal point of the Battle of Germantown during the Revolutionary War. 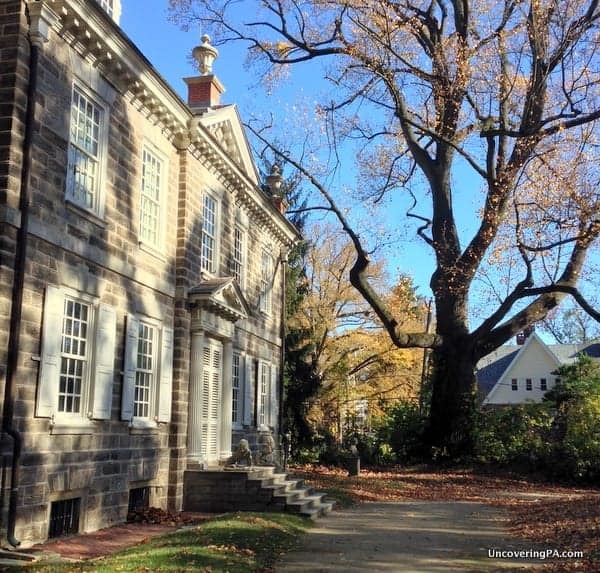 Sitting in the historic Germantown neighborhood of Philadelphia, Cliveden, also known as the Benjamin Chew House, was one of the focal points of the Battle of Germantown during the Revolutionary War. Today, little exists of this battlefield, but the home still stands testament to the battle and bears scars to this day, both inside and out. Make sure to note the bullet holes and indentions left by American cannonballs near the front door of the home. Inside, the home tells the story of both the battle and the Chew family, who lived in the home from 1793 until 1972. Benjamin Chew, the home’s first inhabitant was the Penn family lawyer, close friend of George Washington, and Chief Justice of the Pennsylvania Supreme Court. For more information about visiting Cliveden, visit their website. 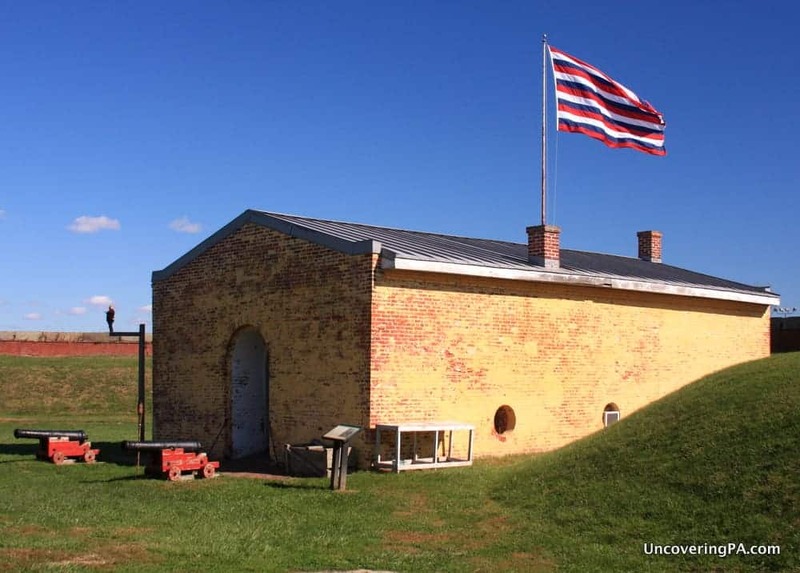 Fort Mifflin was a military fort from the Revolutionary War through World War 2. There are few, if any, historic sites in Philadelphia that have as long and as storied a history as Fort Mifflin. Located south of downtown along the Delaware River, the fort is hidden behind Philadelphia International Airport, but occupies what was an important strategic location along the river 200 years ago. Because of its strategic location, construction on the fort was begun in 1771. However, it wasn’t until 1776, when a group of colonists, led by Benjamin Franklin, finally completed construction. The Americans held the fort until late 1777, when the largest bombardment of the Revolutionary War finally allowed British troops to capture the fort. After the war, Fort Mifflin continued to be used, and served as a POW camp during the Civil War and as a munitions site during World War 2. And, according to many stories by both staff and visitors, some of the former residents of the fort never left, making Fort Mifflin one of the most haunted places in the city. For more information, check out my full article on Fort Mifflin. 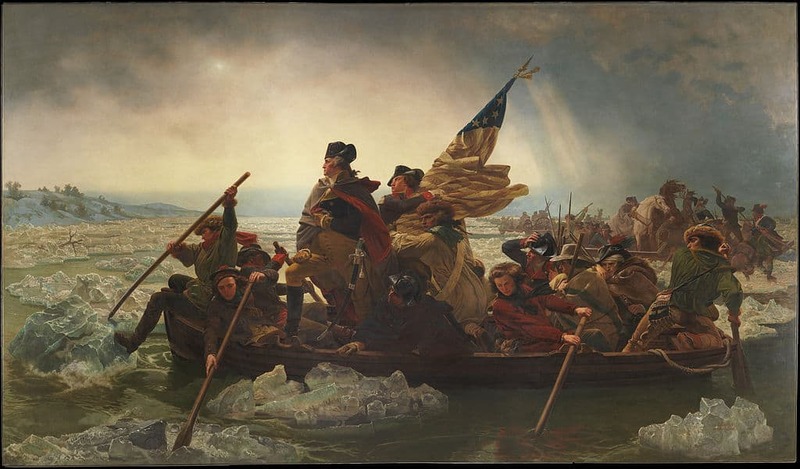 Almost all schoolchildren have seen the famous painting of George Washington and his troops crossing the Delaware River; however, the painting is full of errors and mistakes. Fortunately, the Washington Crossing Historic Park in Bucks County tells the true story of Washington’s crossing, which is just as compelling. In addition to seeing where these events took place, visitors can also tour the 19th century village that was built on the site, see the Thompson-Neely House where future President James Monroe recovered from wounds during the Battle of Trenton, and see the gravesites of the soldiers killed during and after the crossing. For more information, check out my full article about visiting Washington Crossing Historic Park. The Benjamin Franklin National Memorial is just inside the entrance to the Franklin Institute. You might think that the national memorials to all of our Founding Fathers are in Washington, DC, but you’d be wrong. 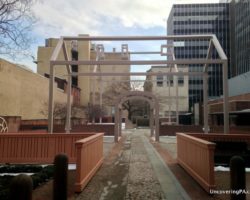 In fact, tens of thousands of people walk right past the Benjamin Franklin National Memorial without even realizing its significance. 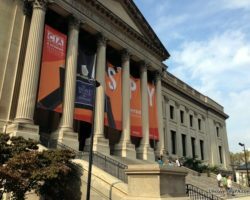 That’s because it is located in the rotunda of The Franklin Institute in downtown Philly. In the middle of the rotunda sits a 20-foot statue of Benjamin Franklin that was completed in 1911 and dedicated in 1938. However, it wasn’t until 1972 that the statue was declared a national memorial. 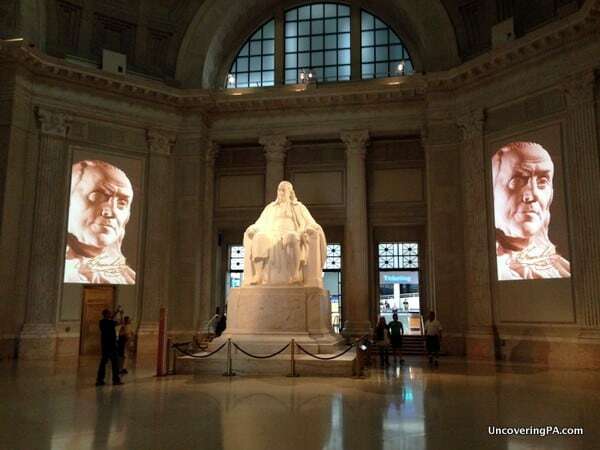 Visitors to the Benjamin Franklin National Memorial can view a 3.5 minute show known as “Benjamin Franklin Forever” that is shown on two screens flanking the statue. More information on the memorial can be found on the Franklin Institute’s website. You might have seen where the Declaration of Independence was signed, but have you see where it was written? Located just a couple of blocks from Independence Hall is the Graff House, better known today as the Declaration House. While this home is a 20th-century reproduction of the original house, it is as faithful as possible. The second floor of the home is set up as Jefferson would have known it during the spring and summer of 1776. Looking at the bustle of the city around the home today, it’s difficult to imagine that this home was chosen because it stood on the outskirts of the city in 1776. More information on visiting this important home can be found here. The Tomb of the Unknown Revolutionary War Soldier is a great place to visit to remember those who died during the war. 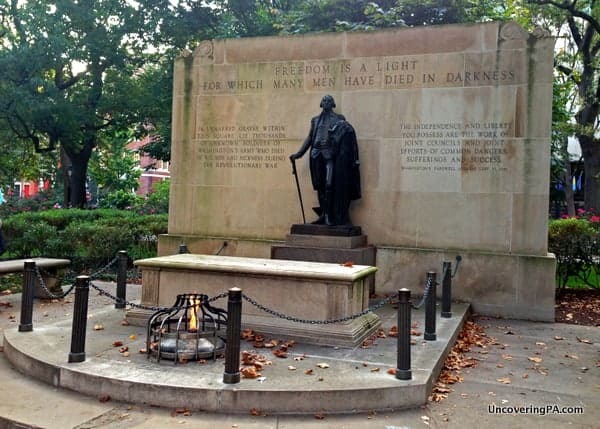 The Tomb of the Unknown Soldiers in Arlington National Cemetery might be more well known, but the Tomb of the Unknown Revolution War Soldier in Philadelphia’s Washington Square is just as significant. The park, which sits a block from Independence Hall, was built on top of many Revolutionary War graves, and it’s unknown how many soldiers are still buried underneath the square. The memorial, which sits in the square’s northwest corner is a memorial to all the fallen soldiers of the Revolutionary War and was built in 1957. It includes the remains of a soldier from the war that was disinterred during archeological work. More information about the Tomb of the Unknown Revolutionary War Soldier and Washington Square can be found on the National Park Service’s website. The Rosenbach Museum has a large collection of items relating to our Founding Fathers. 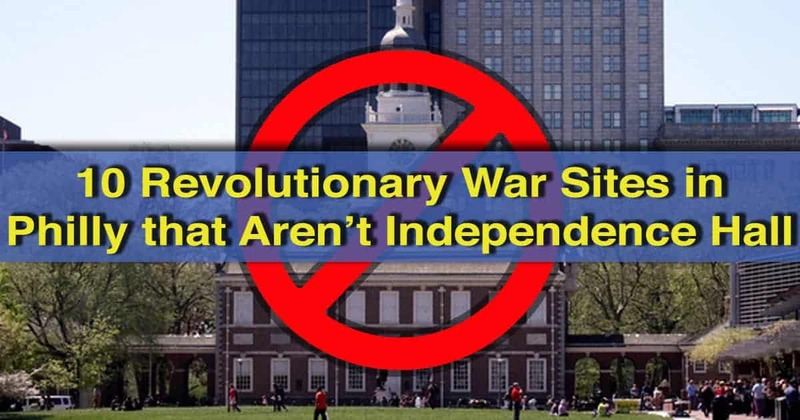 Including the Rosenbach Museum on this list of Revolutionary War-related sites in Philly might seem a bit weird at first. After all, the museum is housed in a home that wasn’t even built until the 19th century and contains a collection of some of the world’s most rare books. However, their collection also includes many items related to the Founding Fathers. This includes items signed by the likes of Thomas Jefferson and George Washington, the oldest known letter ever written by Washington, and the only remaining first edition of Benjamin Franklin’s Poor Richard’s Almanac. You can see many of these items and even handle some of them during the museum’s frequent Hands-On Tours. For more information about the Rosenbach Museum and Library, check out my full article on this amazing place. The Peter Wentz Farmstead housed General George Washington on two occasions in October 1777. 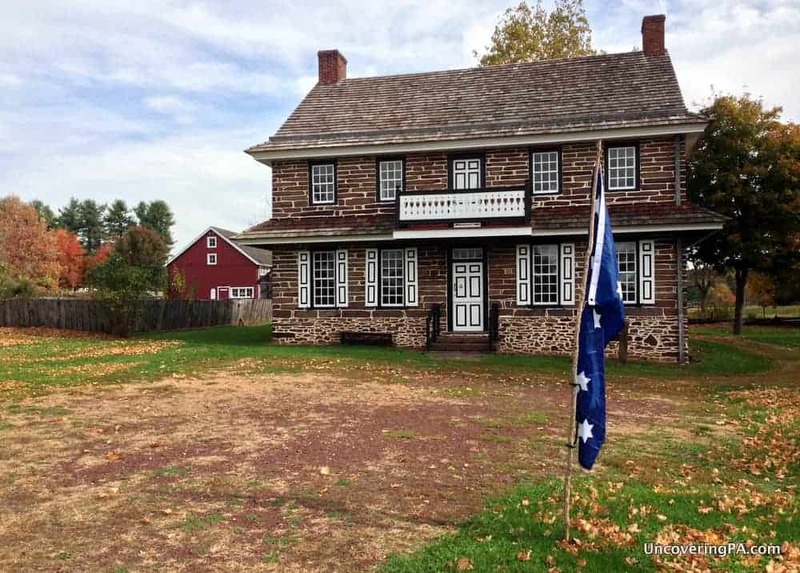 Located a few miles outside of Philadelphia in Montgomery County, the Peter Wentz Farmstead was built in 1744 for the German American Wentz family. All was quiet, until the fall of 1777. Both before and after the Battle of Germantown, George Washington stayed in this home while his soldiers camped nearby. All told, Washington stayed here for about a week in mid-October 1777. Today, the home is available to tour, and it tells the story of the home, what life was like in the 18th century, and Washington’s time at the farmstead. The Peter Wentz Farmstead also has the most unique paint colors that I’ve ever seen in a historic home. 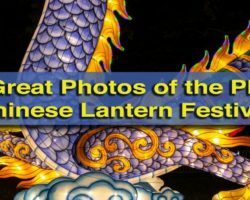 For more information, check out my full article about visiting the Peter Wentz Farmstead.